GtkMessageDialog implements AtkImplementorIface and GtkBuildable. GtkVBox that holds the dialog's primary and secondary labels. The secondary text includes Pango markup. 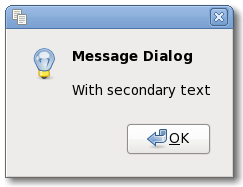 The primary text of the message dialog. The primary text of the title includes Pango markup. Width of border around the label and image in the message dialog. Whether to put a separator between the message dialog's text and the buttons. GtkMessageDialog:use-separator has been deprecated since version 2.22 and should not be used in newly-written code.